The 2019 Volvo XC40 was newly designed for drivers demanding a different and unique experience in a luxury compact crossover SUV. The brand-new Volvo XC40 delivers that experience with a Scandinavian flair. The 2019 XC40 is really a fun vehicle to drive. It offers more power than competitors like the BMW X1 and Audi Q3 on a side-by-side comparison. The newly designed 2019 Volvo XC40 is one of the best luxury compact SUVs in its class, offering the perfect combination of European sophistication, performance and latest technologies in the vehicle. The ride in the all-new XC40 is very comfortable during your commute around town in almost all-weather conditions. Fuel efficiency is very impressive for a vehicle in the luxury compact SUV class. The 2019 Volvo XC40 achieves an EPA-estimated 23 MPG in the city and 33 MPG on the highway. The 2019 XC40 comes in many trims such as XC40 Momentum, R-Design and Inscription. Different packages available like the Premium Package, Vision Package, Advanced Package and Multimedia Package help you customize your Volvo XC40 to your liking in the available dazzling exterior colors. 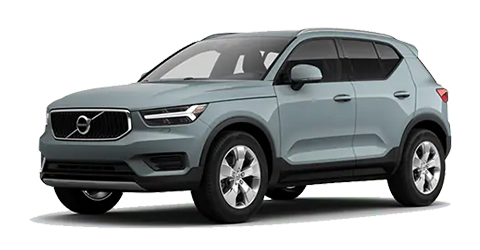 Come test-drive the brand-new 2019 Volvo XC40 at your Volvo dealer: Crown Volvo of Clearwater, FL. The posh interior cabin of the all-new 2019 Volvo XC40 is quite inviting, and it creates a comfortable environment for all passengers. Up to 5 adults can sit comfortably in the XC40 with plenty of headroom and legroom for passengers in the back row. Many storage areas are available throughout the cabin. The materials found in the 2019 XC40 are of the highest quality, making it a truly luxurious compact SUV that can rival competitors like the Jaguar E-PACE or the Lexus NX 300. The list of standard features is extensive for all trims of the 2019 XC40. Standard features include an air filtration system, a leather-wrapped steering wheel, a rearview camera, heated mirrors, bucket front seats, an 8-way power driver seat with power- adjustable lumbar support and much more. Also standard for the Volvo XC40 is a 9-inch touchscreen that you will need to get familiar with since many of the settings for climate control, audio and the vehicle are housed in the menus of the infotainment system. You’ll also find a standard 8-speaker audio system, satellite radio, 2 USB ports with external media control and smartphone integration using Apple CarPlay™ and Android Auto™ for hands-free operations. Available premium features in higher trim levels include keyless entry, a harman/kardon® premium audio sound system, a passenger seat with power adjustable lumbar support and more. Come see for yourself the brand-new Volvo XC40 at Crown Volvo in Clearwater, FL and schedule a test-drive today! 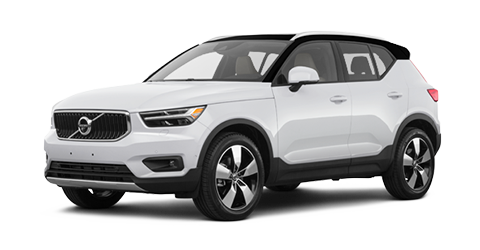 The 2019 Volvo XC40 has a singular classy look that invites you to test-drive the vehicle at first sight. With quick and smooth shifting, responsive acceleration and good handling around corners, the driver of any Volvo XC40 stays confident on the road. You can choose between 2 powertrains: the T4 model that includes front-wheel drive and the T5 that comes with all-wheel drive. With a 2.0L turbocharged engine, the T5 model of the Volvo XC40 outputs 187 horsepower at 4,700 RPM and a torque of 221 lb.-ft. at 1.400 RPM. The all-wheel-drive T5 Inscription model with a turbocharged 2.0L goes up to 248 horsepower at 5,500 RPM and with a torque output of 258 lb.-ft. at 1,800 RPM. The Volvo XC40 does not suffer from a lack of power, making passing other vehicles or entering on the highway a breeze. Come discover the all-new Volvo XC40 at our Volvo dealership in Clearwater, Crown Volvo. With the reputation Volvo has built over the years around driver passenger safety, the all-new 2019 Volvo XC40 has not disappointed the critics. The Volvo XC40 is a fun and safe SUV to enjoy on the road. The list of safety features for the 2019 XC40 is impressive for a compact SUV in its class. Standard features include Daytime Running Lights, a Remote Anti-Theft Alarm System, Emergency Braking Assist, Lane Departure Warning, Lane Keeping Assist, Pre-Collision Safety System, Post-Collision Safety System and so much more Pilot Assist technologies for safe driving in your 2019 XC40. A great shopping experience awaits you at Crown Volvo in Clearwater where you can learn all about the new 2019 Volvo XC40. Crown Volvo proudly serves Clearwater, St. Petersburg, Dunedin as well as surrounding communities, helping you acquire and maintain your Volvo car with certified Volvo parts and excellent service. Come visit with us at Crown Volvo today.